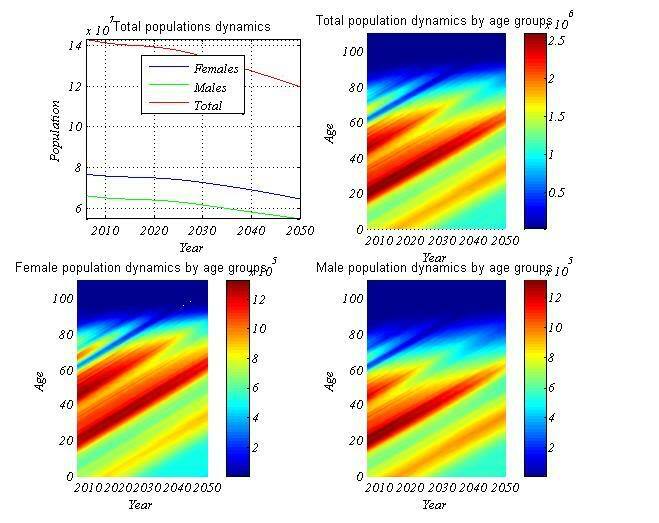 I developed a model on Russia’s future demographic development in Matlab. First, I will describe (non-mathematically) the essentials of how it works; then I will present a range of different possible scenarios. Our data is sourced from Rosstat and the Human Mortality Database. Demography is a social science, and as such it is impossible to make any precise predictions. As such the strategy we will use is to present four different scenarios, which include Stagnation, Low Improvement, Medium Improvement and High Improvement. (The Transformation scenario I was thinking of doing would have involved some rather complicated math and as such I leave it to a later date). They will be described below. First, an examination of basic concepts. The biggest single factor by far in this model are future fertility trends. It basically determines whether the population will go up or down (improvements in mortality statistics only postpone, not alter, underlying trends). The fertility rate itself is the amount of children in any given year a woman could be expected to have, calculated by adding up age-specific birth rates. The amount required for long-term population stability is 2.1 children per woman (because in most countries slightly more boys are born than girls). 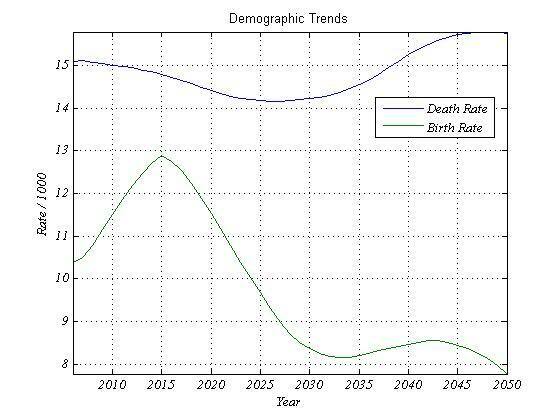 Mortality trends are more useful for ascertaining things such as future dependency ratios, which are important from an economics perspective (assuming the retirement age remains constant). It can also be argued that it is an ethical responsibility of society to maximize the (healthy and fulfilling) longevity of its citizens’ lives. The life expectancy is how long a person can expect to live based on the age-specific mortality indicators of the year in question. Net immigration, in Russia as in many other countries, typically consists of bringing in masses of young workers which help boost the percentage of working-age people within a population. Its merits are debateable. While they certainly put in more than they take out, they can also cause social unrest and lower overall productivity (if they’re uneducated cheap labor). As such, in my opinion the Japanese method of substitituting capital for labor on the factory floor (it has more than a third of the world’s stock of industrial robots) is generally smarter than importing a diverse mob of car-burners (although perhaps I have an insufficient appreciation of the spiritual benefits of multiculturalism). Digressions aside, it is clear that after a relative migratory drought in the early to mid 2000’s that followed the huge influx of ethnic Russians from the Near Abroad, economic progress and impending labor shortages are drawing a new tide of migrants, and this time many more of them are non-Slavic Central Asians and Caucasians (a total of 287,000 in 2007, probably with many more not covered by the statistics). With an understanding of the basics, we can now reveal our first scenario. 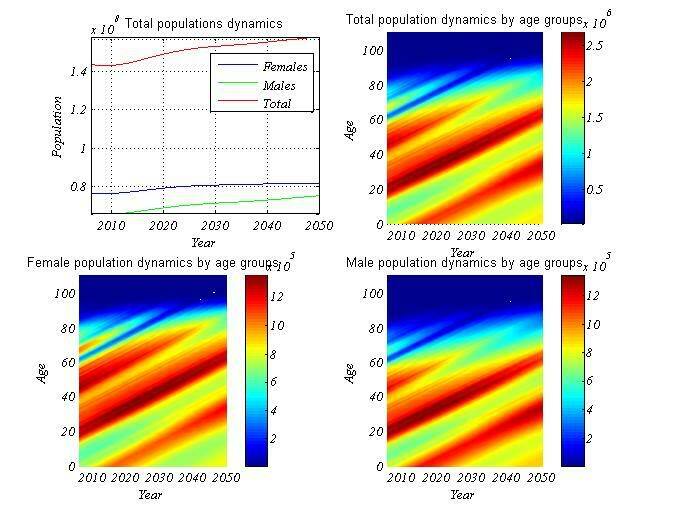 This scenario keeps Russia’s population structure and age-specific birth and death rates as of 2006 constant and projects them to 2050 to get the results below. There is no net migration. The total population in the top-left graph will decline from 142mn today to 91mn in 2050. An amusing corollary is that Russia’s population will equal Croatia’s in 2250 (well, at least that’s still enough to produce a good football team), and the last Russian babushka will die out at the dawn of the next millennium. 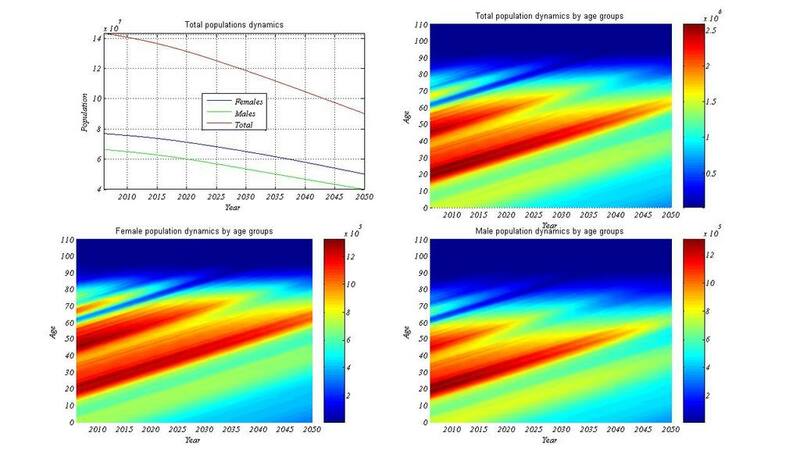 The top right graph shows the population age structure for every year until 2050. Red means more people, blue means less. And it portends a very blue Russia by the middle of the century. 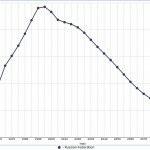 The two graphs below the total population show the female and male population over time. You can also see the “pine tree” shape of the Russian population pyramid (the demographic legacy of WW2, reinforced by post-Soviet fertility collapse) reflected in the alternatingly-colored diagonal bands across the graph. Of course, in reality this (pretty much worst-case) scenario is extremely unlikely to happen. 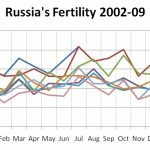 On the other hand, it does illustrate where all predictions that Russia’s population will fall to around 100mn by the middle of the century are coming from – they simply posit constant, or at best slow changes, in fertility and mortality rates. In reality, change is unlikely to be slow (at least in mortality, which unlike fertility is at least somewhat predictable). Medical technology is improved at exponential rates and this in turn is driving down mortality rates from circulatatory diseases and cancers – also at exponential rates. Just look at the graph below for Swedish mortality over time. 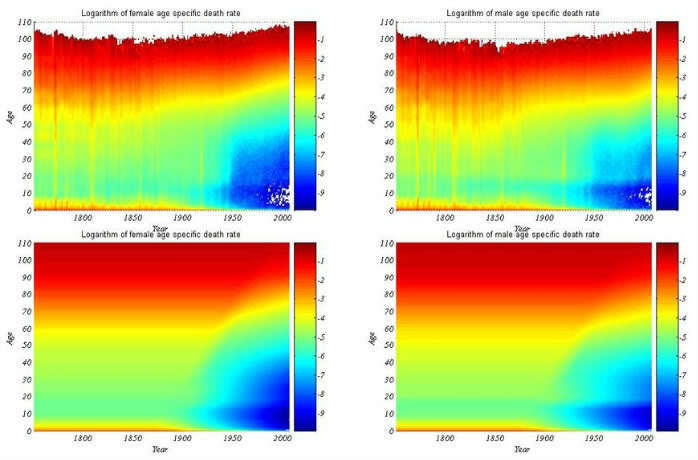 The two upper graphs show female and male age-specific death rates from 1751 to 2006. The line which tends down sharply from around 1870 and crosses several others corresponds to infant mortalty (0 years). From bottom to top, the other lines correspond to death rates at the ages of 10, 20, 30, 40, 50, 60, 70, 80 and 90. Note how death rates remained essentially flat up to the middle of the nineteenth-century, but then started falling exponentially (straight lines against a logarithmic scale) amongst younger age groups, before encompassing progressively older cohorts. 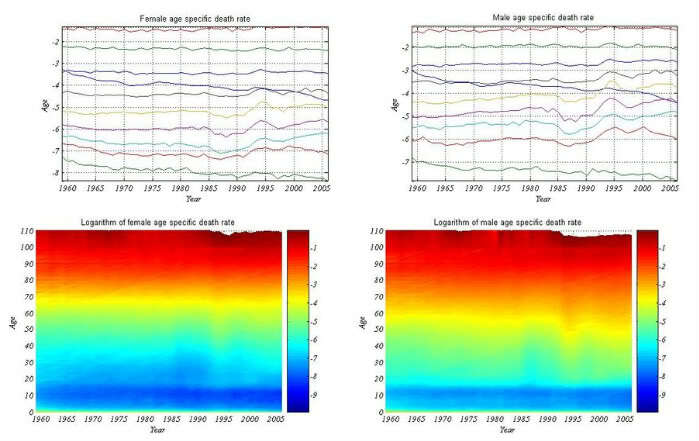 The bottom graphs show the age-specific mortality for every Swedish age group from 1751 to 2006. 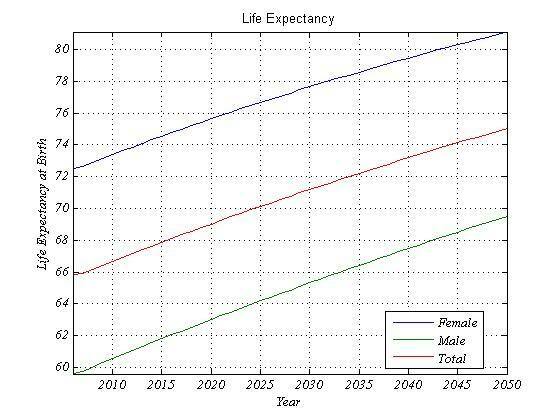 Note the astounding exponential improvements seen in mortality across the board since the early twentieth century. The white dots amongst the blue region, particularly prominent amongst girls, are actually years when presumably no children died at those particular ages in Sweden. Now a reasonable objection would be that Russia, thrice poorer per capita than Sweden, does not have access to that wonderful exponentially improving medical technology. That, however, is not the case, as a cursory glance at the graph below will show. It clearly shows mortality improvements amongst the younger generations (under 15 years) advancing at an exponential rate throughout the period (albeit even today only matching 1960’s Sweden). Meanwhile, the greatest regression is amongst middle-aged men. Note the dips in the late 1980’s and the spikes in the mid-1990’s. What should this tell you? Wake up and smell the vodka! 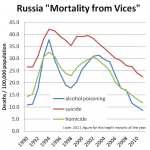 Russia’s catastrophic mortality rates, as thoroughly explored in the second post, are closely correlated with the alcohol/food price ratio – around a third of all deaths can be attributed to alcohol abuse, with working age men being the most strongly affected. All the familiar patterns (Gorby’s anti-alcohol campaign; flunctuations in the food-alcohol price ratio in the post-Soviet period; etc) are reproduced. This has happened in stark contrast to mortality improvements amongst children and the intelligentsia (incidentally, two groups with lesser propensities for alcohol abuse), and as such the exceptions prove the rule. We took Sweden to be a ‘universal model’, since it a) has comprehensive mortality records going back to 1751, b) it has always been at the forefront of medical technology and c) it has not been involved in large scale wars or long-term catastrophic social trends (e.g. mass alcohol abuse) that would otherwise skew the data. To approximate Swedish mortality trends, we modelled mortality for every age group as a straight line, before initiating an exponential best fit to the historical data at a particular time. This depended on their age. For infants, it was 1860; for 50-year old’s, it was 1910; for people of age t, the year mortality began its exponential fall was 1860+t. While admittedly crude, it does indeed look that the moment when mortality decline really took off from the exponential runway at any particular age could be approximated by a right-leaning diagonal straight line originating at 1860 or thereabouts. The results of the model are the two graphs at the bottom of the image below, while the two graphs at the top are the historical records for comparison. 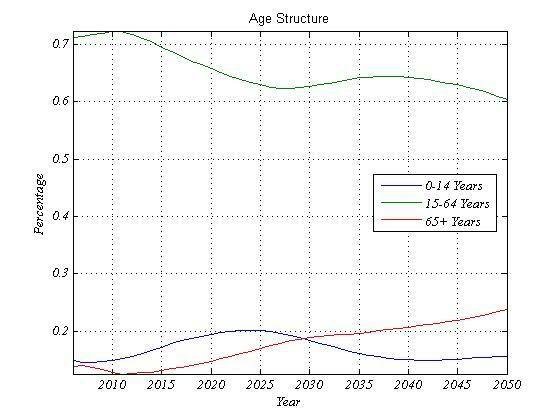 As you can see our model looks remarkably accurate, projecting the whole improvement in mortality across an ever broader age spectrum. 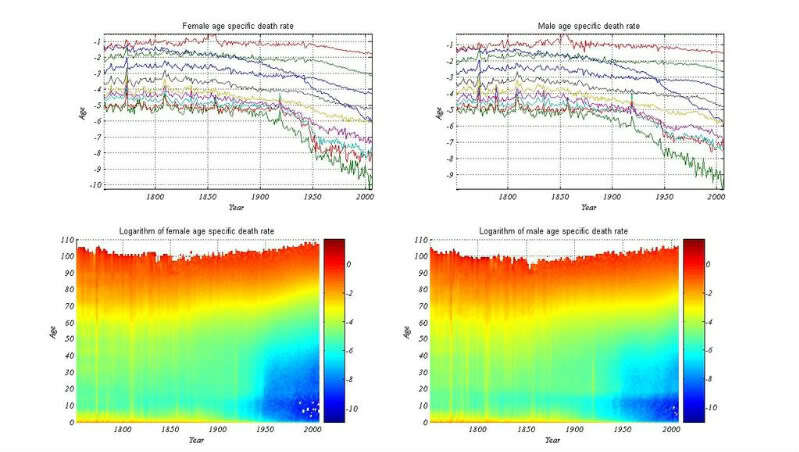 For obvious reasons it cannot predict the sharply delineated mortality spikes seen early on, e.g. around 1770, 1810, 1860 and 1980, which corresponded to particularly virulent plague outbreaks. However, it is, interestingly enough, successful at replicating 30-year olds’ lower mortality compared to 20-year olds. Mortality. We took the exponents derived from the universal (Swedish) mortality model and grafted them onto Russia’s demographic profile. However, in this case Russian mortality will remain the same relative to Swedish mortality forever, even as they both improve exponentially. In real life this would only be expected to happen if lifestyle habits for Russia and Sweden were to remain frozen vis-à-vis each other. In practice it’s likely the government will intensify its efforts to contain and suppress the alcohol epidemic and other typical, negative Russian lifestyle choices (smoking, diets high in animal fats and glycemic loads, lack of exercise, etc). As such we added two convergence coefficients – one describing how fast Russia approaches Sweden relatively, and another describing how fast the age groups that are farthest apart converge compared to the age groups that are closest together in their death rates. The rate of convergence for each Russian age group is dependent on the gap between it and its Swedish counterpart. Fertility. Is extremely difficult to predict, and as such will be the (hopefully educated) guesswork that forms the core of my scenarios. But it really is extremely uncertain. For instance, there’s no concrete explanation for why fertility rates remain healthy in some developed countries (like the US or France) and very low in others (e.g. Germany, Italy, Spain, Japan). First, there will be a three year adjustment period to a fertility of 1.4 from today’s 1.3. Then, we will linearly extrapolate fertility levels in blocks of years (e.g. we could have it rising to 1.9 from 1.4 in 2006, staying constant for ten years, then sharply falling to 1.2 in 2025 and remaining at that level until the end of the simulation in 2050). Today the average Russian woman gives birth in her mid-20’s, which is early by the standards of most advanced industrial countries. We have set the parameters such that Russia’s 2006 age-specific birth rates linearly converge to that of another country (from a choice of the UK, Australia, France, Germany, Italy, Spain and the Netherlands) at a year of our choosing. Migration. As with fertility, done in linearly extrapolated blocks. At any year we can choose to set it either as a certain percentage of the total population or as an absolute number. Since migration typically functions on a quota system, in practice we will always opt for the latter. Migrants will be equally split between men and women and will be normally distributed across age groups with an average age of 25 and variance of 10. And now the really fun bit…seeing Russia’s futures unfold before our eyes! The population size eases down to 139mn by 2020, before plummeting down to 119mn at the end of the simulation. 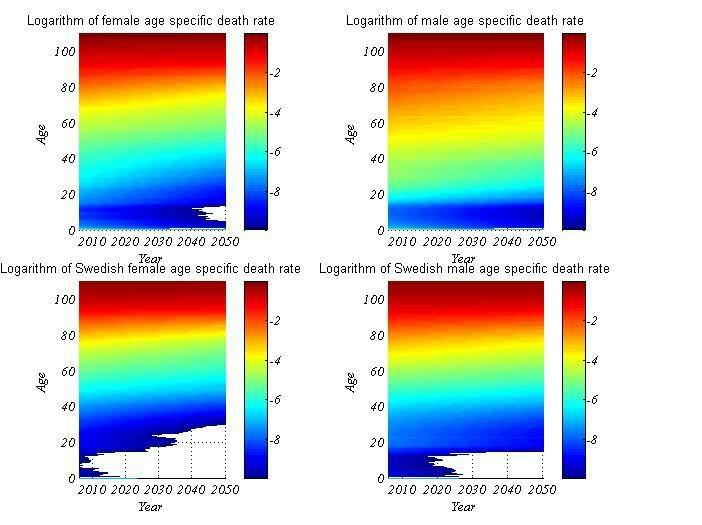 Russia’s female age-specific death rates by 2050 will catch up to Sweden’s today, but men will continue to lag even by this measure (their 25-year olds will die at the same rate as Swedish 45-year olds and Russian 18-year olds in 2006). Total life expectancy will rise from 66 years to 75 by the end of the period, albeit the gender gap will remain the same (since there is no convergence in this scenario). On the positive side, continuing high mortality rates will mean that the working age percentage of the population will remain high, falling to 64% in the late 20’s before rising and again falling to 63% by 2050 – which imply completely manageable dependency ratios. 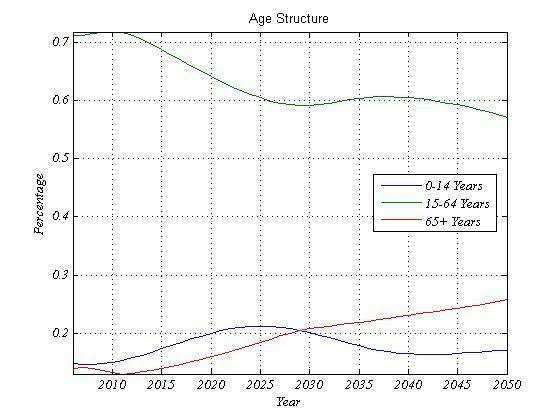 Meanwhile, the share of youngsters and old people will change to 13% and 24%, respectively. 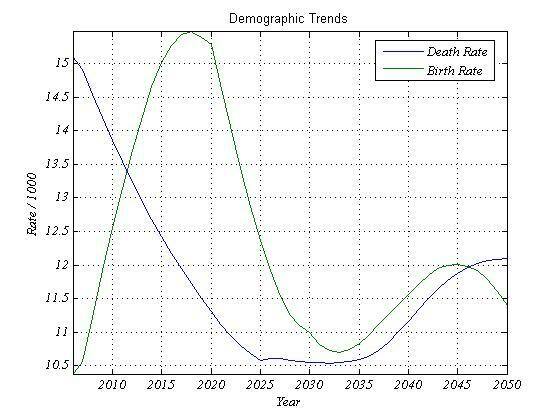 The birth rate will be lower than the death rate throughout the entire simulation and the lowest rate of natural population decrease will be reached around 2015. The population will decline gently until 2010, when it will start growing again for the first time in nearly two decades. The demographic reversal will gain strength and in 2025 for the first time in its history Russia’s population will surpass the 150mn figure. By 2050 there will be 157mn Russians. At that time Russian women will die at the same rate as Swedish women, although Russian will still have a little bit of catching up left to do with their Swedish counterparts. 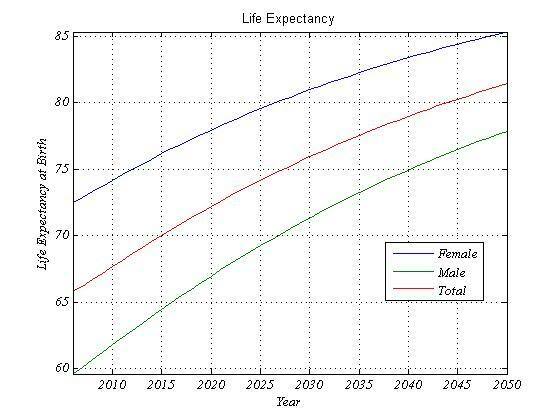 Total life expectancy will reach 72 years in 2020 and surpass 80 years sometime in the 2040’s, with the gender gap narrowing from 13 years today to 7 years at the end. 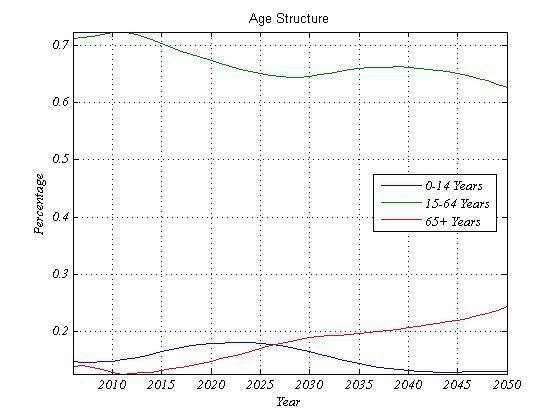 The age structure will not be radically different from the first scenario, the main difference being in more children and fewer workers. On the other hand workers will still make up 60% of the population by 2050 so there is no cause for worry. The birth rate will surpass the death rate for the years 2012-25, but will fall slightly below it for the remainder of the period. However, migration will cause the overall population to grow throughout the whole period. 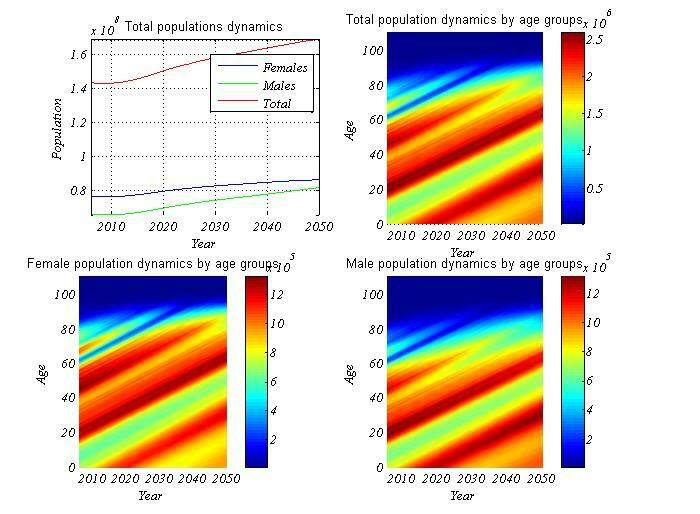 The population should start growing around 2010, surpass 150mn by 2025 and reach 168mn by 2050. 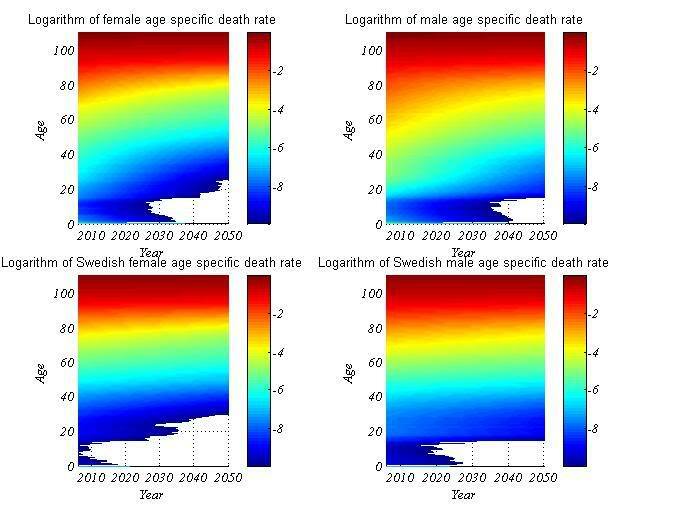 Death rates amongst both sexes will converge to Swedish levels before 2050. Life expectancy will reach 75 years in 2020 and nearly 84 years by the middle of the century. The working age share of the population will dip below 60% around 2030, rise slightly and plunge to 57% by 2050, the extra places being taken up by youngsters (17%) and older people (26%). The birth rate will remain above the death rate from 2012 until the late 2040’s, and natural population growth will be further boosted by migratory inflows. The final question is, which of the above scenarios is most likely? The fertility rate has soared since 2006 and will likely surpass 1.5 this year. While it has been boosted (or rather, brought forward) by the recent introduction of generous maternity benefits, I believe this is a sustainable trend. (The Low scenario, however, treats it as a one-off whose effects will fade away in time). Recall the first post, where we estimated Russia’s ‘planned fertility’ to be 1.95 and its ‘desired fertility’ 2.44 (as such, the Medium scenario reflects the former and the High scenario, the latter). As such I think it likely that as economic development continues fertility will rise to a level somewhere between those two figures, before beginning to decline again as is the case in most rich countries. My instinctive feeling is that it will be closer to the Medium than to the High scenario, however. The mortality rate has registered significant improvements in 2007, although progress has ceased in the first five months of 2008. On the other hand as we saw in the second post rapid and sustained improvements in mortality are possible, as in North Karelia from 1970 to 1995, or in Estonia recently, which raised its life expectancy from it’s post-Soviet low of 66.6 years in 1994, to its typical Soviet value of 69.7 in 1998, and has since further boosted it to 73.0 by 2005. 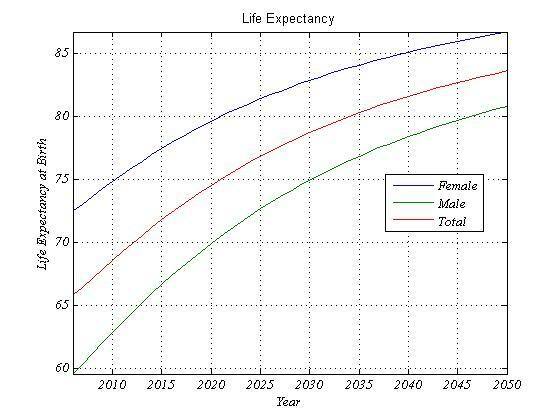 As such, Putin’s call in February 2008 to ‘do everything in our power to bring about a more than 1.5-fold reduction in the death rate, and to raise the average life expectancy to 75 years by 2020’ is achievable, and his sentiment that ‘we will succeed in stabilising the population over the coming 3-4 years’ also seems realistic, given the recent fertility rise. Therefore, I think that mortality will improve along a path somewhere between the Medium and High scenarios, perhaps with a bias for the High. As we discussed in the second post, a big unknown was the AIDS epidemic. Since then, however, I’ve found this comprehensive report on the subject. Suffice to say we’re not heading into an African-level epidemic any time soon and as such I was justified in discounting excess deaths from AIDS mortality in the model (which peaked in 2006 and has since fallen sharply, while the peak of new infections was reached back in 2001). Migration nearly reached 300,000 last year and for the first five months of 2008 has been higher 16% higher than in the equivalent period back then. As such, I think a figure of 300,000 per year is justified. While the flow from CIS countries will dry up in time, as Russia becomes a developed country many more people from the far abroad will want to move in. In particular, global warming will open up vast new areas for settlement. Coupled with climate change-related devastation in inundated Bangladesh, the parched Sahel and perhaps even the environmental collapse of parts of China and India (due to the melting of the Himalayan glaciers that sustain their great rivers), the world may see a tide of refugees fleeing to northern countries with lower population densities and untapped resources. In this case, in the later part of our simulation we could see migratory inflows to Russia reach half a million (as in the High scenario), a million, millions or even tens of millions per year, should there be catastrophic failure in the planetary climate system and no available techno-fix. Which leads us to the main question – in the next fifty years, as both technological progress and environmental destruction speed up exponentially, which will win? Will civilization leave behind deserts, as predicted by the French philosopher Chateaubriand, perhaps with only the plastic detritus of its latter-day consumerist orgies, scattered in the sands as the only banal testament to the sublime grandeur of collapsed civilization; or will we plant new forests in cyberspace and transcend into the leafy realms of the technological singularity even as the world we leave behind withers into the desert of the real? The point I’m making is that, given the magnitude of the creative and destructive trends currently at work, making predictions about 2050 is fraught with uncertainties. Transhumanists believe we will have upgraded our bodies and reached acturial escape velocity, when life expectancy goes up by more than a year, every year (in effect, people grow younger, as measured by their chances of dying at any particular age). Malthusians believe that vital industrial and agricultural resources would have become exhausted, vaccines will fail against ever evolving pathogens and mortality will soar as war, pestilence and famine insert themselves back into society with a vengeance. As such, a Transformation scenario accounting for this panoply of trends, will be extremely hard to model and extends well beyond demography into areas like economics, sociology, etc. But back to Earth, I will make some concrete, falsifiable demographic predictions (something Russophobes going on about Russia’s impending demographic doom wisely avoid doing). 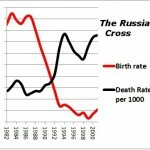 Russia will see positive population growth starting from 2010 at the latest. Natural population increase will occur starting from 2013 at the latest. Russia’s total life expectancy will exceed 68 years by 2010 and reach 75 years by 2020. 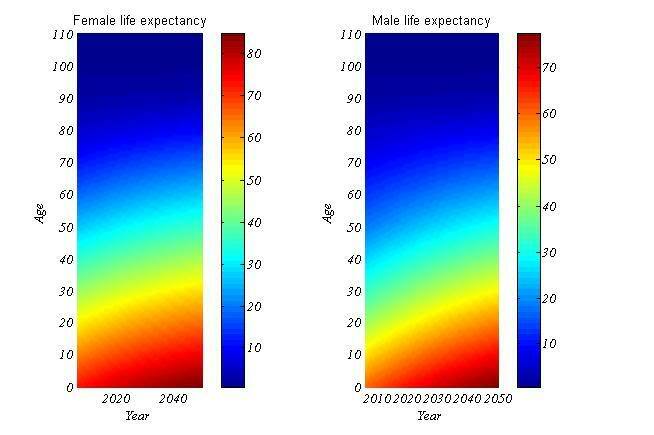 The gap between male and female life expectancy will decrease by 2010. The share of Russia’s working age population will peak around 2010 at about 72%. AIDS will not affect more than 1% of the population. That is all, for now. Feel free to comment and offer feedback. If you want to, you can give me some key data (e.g. your idea of how fertility will change, the rate of mortality decline, etc) so that I can run them through the model and tell you how that would play out over fifty years.